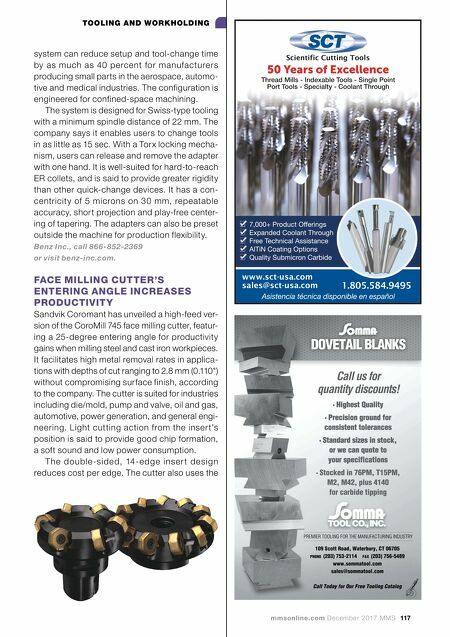 116 MMS December 2017 mmsonline.com TOOLING AND WORKHOLDING SWISS-TYPE GROOVING TOOLS EXTENDED TO GENERAL LATHE MARKET Tungaloy is broadening its TetraMini-Cut series of grooving tools for Swiss-type machines to include new inser t lines for the general lathe m a r k e t . T h e p r o d u c t s f e a t u r e c o m p a c t , four-cornered inserts that are securely clamped in a pocket for indexing repeatability and tool life stability. The line now includes two chipbreaker styles. The TCG chipbreaker incorporates optimized rake angle and edge preparations and is suited for the automotive industry. The TCP chipbreaker features a large rake angle with a sharp cutting edge. Its maximum depth of cut is 3.5 mm (0.14"), enabling a range of applications. To meet the requirements of small and miniature part manu- facturers grooving with R0.1 mm (R0.004") or smaller, the TCP line also includes inserts with R0.05-mm (R0.002") corner radii. 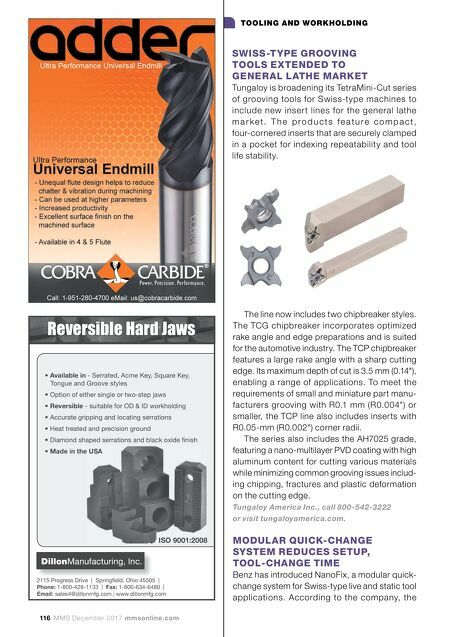 The series also includes the AH7025 grade, featuring a nano-multilayer PVD coating with high aluminum content for cutting various materials while minimizing common grooving issues includ- ing chipping, fractures and plastic deformation on the cutting edge. Tungaloy America Inc., call 800-542-3222 or visit tungaloyamerica.com. MODULAR QUICK-CHANGE SYSTEM REDUCES SETUP, TOOL-CHANGE TIME Benz has introduced NanoFix, a modular quick- change system for Swiss-type live and static tool applications. According to the company, the 2115 Progress Drive | Springfi eld, Ohio 45505 | Phone: 1-800-428-1133 | Fax: 1-800-634-6480 | Email: sales4@dillonmfg.com | www.dillonmfg.com Reversible Hard Jaws ISO 9001:2008 • Available in - Serrated, Acme Key, Square Key, Tongue and Groove styles • Option of either single or two-step jaws • Reversible - suitable for OD & ID workholding • Accurate gripping and locating serrations • Heat treated and precision ground • Diamond shaped serrations and black oxide fi nish • Made in the USA | DillonManufacturing, Inc.